SNAPPY Grains? is a Progressive Foods? 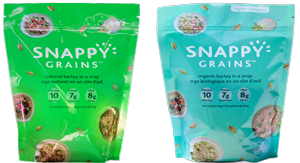 brand with two product lines: Natural Barley in A Snap and Organic Barley in A Snap. SNAPPY Grains? barley is an excellent source of protein, fibre and cholesterol lowering soluble fibre-beta glucan.